Asparagus is one of my favorite vegetables. It’s delicious and beautiful, with its vibrant green color and pretty tips that look like flowers. Even my teenage son likes it, which is saying something! The best thing about asparagus is that it’s easy to prep and quick to cook. When they’re in season they’re supper affordable too. In this recipe, asparagus spears are simply seasoned with olive oil, salt and pepper and grilled on a homemade tray. Make these grilled asparagus next time you barbeque, they’ll become one of your favorite side dishes. Enjoy! Bend the asparagus spear, holding the bottom end and the middle. Apply a little pressure and the tough end should snap right off, discard the tough ends. 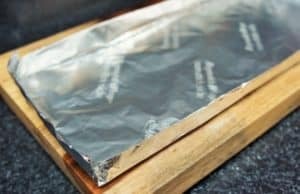 Cut a piece of aluminum foil that is large enough to fit all of the asparagus. Fold the edges a couple of times to form a sturdy rim. Brush the aluminum tray with a little bit of the olive oil. 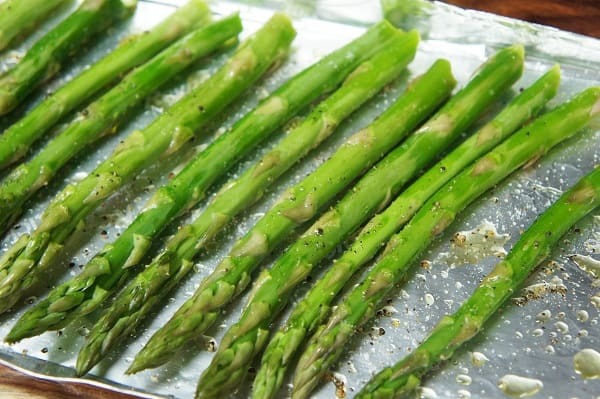 Arrange the asparagus on the aluminum tray without overlapping. Brush the asparagus with the olive oil, roll them a little bit to get the olive oil on all sides. Sprinkle the asparagus with the salt and black pepper, again, rolling them back and forth a little to get the seasoning on all sides. Cook the asparagus on the aluminum tray on a preheated grill, over low heat for approximately 10 minutes or until the desired tenderness is reached. Serve the grilled asparagus with your favorite barbeque meal. Enjoy! 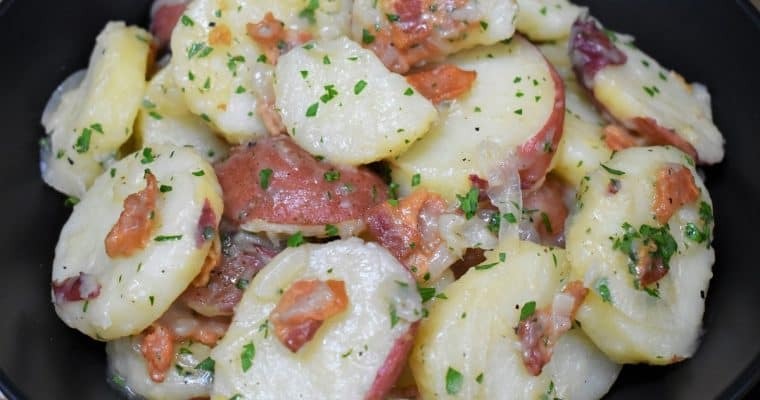 This is a simple warm potato salad that makes a wonderful side dish for any meal, or Oktoberfest celebration. In this recipe, red potatoes are boiled until tender. Then they’re combined with onions, bacon and a sweet and tangy sauce. It’s a delicious potato side dish that is sure to become a favorite. These marinated tomatoes make a fantastic side dish for summertime cook-outs and busy weeknights. In this recipe, plum tomatoes and paper-thin sliced onions are marinated in a balsamic vinegar dressing. This is a quick and easy tomato salad that can be made ahead of time, actually, it’s encouraged!